Host Joan Steffend and designer Barbara Sculati bring warm earth tones to a bland living room. A warm tan tone on the walls brings out the beauty of the woodwork. Lush fabric with a vintage beaded centerpiece is used as an elegant window treatment. A sari is cut in half and used to soften the doorway into the dining room. 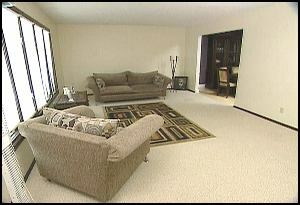 Neutral cushion covers hide the pillow print in order to accommodate more color in the room. 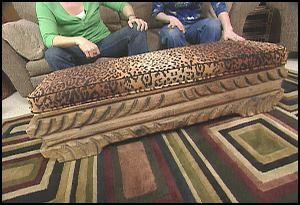 Sculati splurges on a carved coffee table from a thrift store, which she tops with an upholstered cushion. The original coffee table is recovered for a charming window seat. An old coat is recycled into pillow covers. A cozy reading area is created with a matching chair and ottoman. A divider screen is enhanced with a decoupage treatment using brown and black construction paper. A marble pattern is created on plain brown paper by spraying on a mixture of tempera paint and water. A plant stem is used as a stencil to create a contemporary safari-inspired painting. Sculati brushes the wall color onto the stem, dabs on dark brown paint then presses the paint onto the canvas to create a bamboo pattern. Tea is dripped onto the surface to tone down the stark white canvas. A collection of carved wood accessories and a lantern (with the electrical parts removed) are grouped together on the wall for an interesting vignette.